Teaching Skills, Changing Behaviors and Delivering Tools that Build Financial Strength in the American Household! Financial Strength Builder™ (FSB) was designed in response to today’s need for education on basic sound financial practices and a return to making financial stability a priority. After years of administering programs to help families get out of debt, it quickly became apparent to the founders that debt was not the only reason families were living paycheck to paycheck. It was simply the symptom of a much bigger problem; the lack of financial skills, education, tools and behaviors necessary to create financial stability. After developing and delivering financial education in many forms for our clients, we learned that very few were taking advantage of them. Our surveys and focus groups led us to the conclusion that educating people about household financial matters in a fun, online experience would captivate and hold people’s attention while providing help with behavioral changes that would encourage long term success. We recognized that the process of learning had to be delivered in a convenient and automated system that provides privacy on a very personal subject. It also had to be a simple and easy step by step process that followed the basic principles of personal finance, yet was practical enough to deliver the instant gratification of either an “ah ha” moment or a way to find money in a person’s existing budget. Finances are boring and scary to face sometimes. I relate it to getting on the scale when you need to lose weight. You are horrified, but will most times make a change in your eating habits, even if you only small changes. Personal finance is no different. If you become horrified with where you are with your finances today and only make a few changes, you start making progress. Hence, The Financial Strength Builder™, has been developed to create educational and learning tools including the Financial Strength Score™, and The Frugality Game™, Interestingly, the game was inspired by the mother of one of the founders, who lived during the depression of 1929. As a single mom raising herself and her brother on a very small income, she watched as her mom managed her money using envelopes to budget her cash. The envelopes were sorted by category like rent, groceries, fun money, saving account and so on, allowing her to stay within a budget and yet have extra cash if there was an emergency. When the envelope was empty, mom stopped spending. 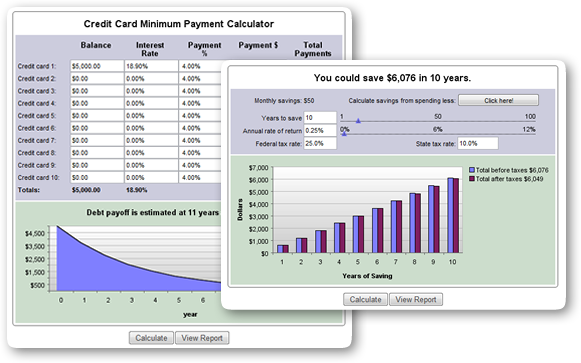 The Frugality Game™, including an electronic version of the envelope system, was developed as a tool to create the behavior needed to experience the feel-good results of making better financial decisions. Subsequently Frugality Teenz™ and Chalkboard Kidz™ were also developed to teach our next generation. Personal Finance is simple. Do not spend more than you make!! So why do so many people have difficulty executing this simple concept? Because, like weight loss, you have to change your lifestyle and that’s hard. FSB has created a unique combination of technology and people that allows you the privacy to work at your own pace online, but have available the expertise of a personal finance advisor when you get stuck or just want to talk to someone. The FSB program guides you along your path to financial freedom and provides the satisfaction that comes from knowing that you are in control of your money. It has everything you'll need to know, in a simple, fun-filled environment, including financial tools, every day bargains and deals, tools to monitor progress, online financial direction, and personal financial training to help you achieve fiscal strength – fast! How Do We Use Information We Collect Through This Webpage? FSB will only collect your name and email address from this webpage, which will be stored securely on our servers and only used for the sole purpose of providing email communications to you. Except as set forth below, we will not share your personal information with any third party without your permission. · Legal and Government Authorities: We may disclose your information to proper authorities when we have a good-faith belief that such action is necessary to comply with applicable laws, valid legal processes, a court order, a judicial proceeding, or to protect our rights or property. We take reasonable measures to protect your information on our servers. When you submit information via email or on this Webpage, your information is protected both online and offline. Although we exercise the utmost care in safeguarding your information, we cannot guarantee the security of information transmitted over the internet. Please understand that whenever you voluntarily disclose personal information online (such as through an email message or through filling out an online form), this information cannot be made 100 percent secure and, in some cases, that information can be intercepted, collected, and used by others. Land of Philippines - Day 60 & beyond! With your membership in the Financial Strength Builder™ (FSB) you’ll be able to take advantage of our easy to follow step-by-step process to get your finances under control and start saving some serious money to build financial strength! 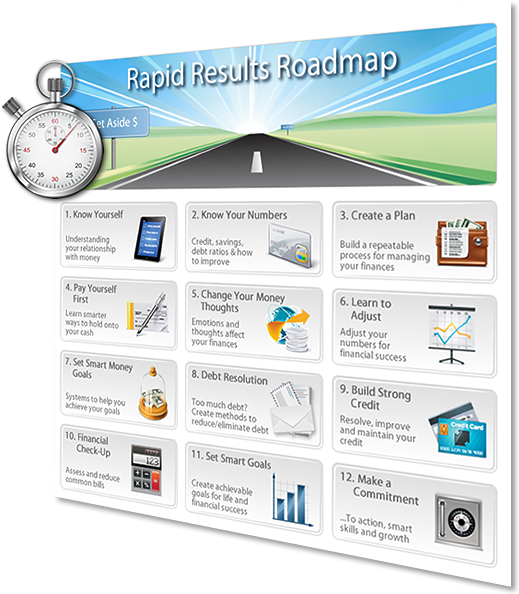 We offer 12 sessions in the Rapid Results Roadmap to guide you through the process of building your financial foundation and show you how to continue to grow from there. Your credit score (which is what we always hear about) is all about the banks and reducing their risk whereas the FSS is all about you, your security, and your ability to withstand unplanned events! After you've listed your income and lifestyle in a structured format, the FSS system creates a personalized plan for achieving long term financial goals by designing ways for you to modify your finances so that you can find additional money each month. Financial stability depends on a structured process and the Financial Strength Builder™ automates and manages what you make, spend, and save. Budget Management - Build a repeatable process for tracking and managing all your finances. Savings System - Pay yourself first and automate the savings process. Credit Building- Implement lifetime habits that will improve your credit, increase your buying power and reduce the interest you pay over your lifetime. Debt Reduction- Learn ways to eliminate bad debt, understand when debt can be an asset. Financial Strength Builder™ (FSB) was designed in response to today's need for basic sound financial practices, a return to financial well-being, and the ability to realize one's dreams while providing for the future. Financial Strength Builder's founders have many years of experience in the financial services industry. Working with consumer finance, they recognized that financial needs have changed, with a growing demand for training on financial basics. FSB founders identified a lack of knowledge today about even the most basic of household finances. Many people are living paycheck to paycheck, sometimes compromised by even the smallest of unexpected expenses. Financial hardships can be caused by deaths in the family, one or both spouses losing their job, medical hardships or other emergencies. Others, with homes they depended upon as a source of cash, now find those homes have lost their value. The desire to help educate American households in financial literacy, while showing them how to increase their financial strength, forms the basis of the mission statement for Financial Strength Builder™. Financial Strength Builder™ is designed to provide solutions for achieving ones best financial life through a unique blend of life coaching and financial direction designed to help build greater financial strength. The founders of FSB thought the most effective way to educate people about relatively boring and dry financial matters would be to create a fun, online game that would captivate and hold people's attention while educating them on basic household finances, including help with behavioral changes that would facilitate continued interest and growth in one's ability to achieve financial strength. The first 'edutainment' tool, The Frugality GameTM, was soon developed. Since then The Frugality Game™ has evolved helping many people stabilize their finances while providing some measure of relief from long standing financial stress. Educating adults in distress was the first step, but FSB then went on to address basic financial literacy with children. If we could create financially literate children, then as adults they may not have to go through the financial hardships their parents did. Going out to the non-profit market, pilot programs were done with various groups looking for a way to educate children in financial literacy. These pilot programs achieved success and were instrumental in the development of two new children's tools, Frugality Teenz™ and Chalkboard Kidz™. In addition to The Frugality Game™, Frugality Teenz™ and Chalkboard Kidz™, FSB addresses the needs of adults with the Financial Strength Score™ (FSS) and the concept of the Four Foundations of financial strength . From targeted financial rescue strategies and basic financial literacy for adults, to the financial education of one's children, to financial education and single source savings. FSB is the only company to have addressed the issue of successful personal finance from all directions, providing the user the opportunity to not only become financially literate, but giving them ongoing tools that allow them to be able to hope again and make plans for their future. Financial Strength Builder is primarily delivered through approved service providers. For questions about your financial service account, please contact your provider directly. This information can be found in the emails you receive. Do NOT email financial documents to this address as they will not be fowarded. Contact your financial service provider. The information on this website, related pages, its links, or any documents contained herein, are not meant to be a substitute for professional advice and are intended only to inform, assist, and educate users in the areas of credit and debt management. TFG Inc and its agents and employees cannot and will not provide legal advice. In some instances, it may be wise to seek professional help from competent legal counsel. TFG Inc and its agents and employees, hereby disclaim any responsibility for any consequences of the use by anyone of the information contained at this site. By use of our website and the links contained herein, and any related service or product offered through our website, either directly or indirectly through an affiliate or associate of our agency users agree to hold TFG Inc harmless for any and all damages arising out of its use. By continuing to view any pages of this website you are agreeing to the following Terms and Conditions. We have taken every effort to design our website to be useful, informative, helpful, honest and fun. Hopefully we have accomplished that – and would ask that you let us know if you'd like to see improvements or changes that would make it even easier for you to find the information you need and want. We are not responsible for typographical errors. We reserve the right to cancel any order if there was a typographical error on our site concerning pricing and program description. We reserve the right to change the terms and conditions without notice. No employee, coach or other representative has the right to vary any of the policies or terms and conditions regarding the sale of our products. All we ask is that you agree to abide by the following Terms and Conditions. Take a few minutes to look them over because by using our site you automatically agree to them. Naturally, if you don't agree, please do not use the site. We reserve the right to make any modifications that we deem necessary at any time. Please continue to check these terms to see what those changes may be! Your continued use of this website means that you accept those changes. or sell the material or to reverse-engineer, disassemble or otherwise convert it to any other form that people can use. THE CONTENT AND ALL SERVICES AND PRODUCTS ASSOCIATED WITH FINACIALSTRENGTHBUILDER.COM ARE PROVIDED TO YOU ON AN “AS-IS” AND “AS AVAILABLE” BASIS. TFG INC. MAKES NO REPRESENTATIONS OR WARRANTIES OF ANY KIND, EXPRESS OR IMPLIED, AS TO THE CONTENT OR OPERATION OF FINACIALSTRENGTHBUILDER.COM OR OF THE SERVICE. YOU EXPRESSLY AGREE THAT YOUR USE OF THE SERVICE IS AT YOUR SOLE RISK. TFG INC. MAKES NO REPRESENTATIONS, WARRANTIES OR GUARANTEES, EXPRESS OR IMPLIED, REGARDING THE ACCURACY, RELIABILITY OR COMPLETENESS OF THE CONTENT ON FINACIALSTRENGTHBUILDER.COM OR OF THE SERVICE AND EXPRESSLY DISCLAIMS ANY WARRANTIES OF NON-INFRINGEMENT OR FITNESS FOR A PARTICULAR PURPOSE. TFG INC MAKES NO REPRESENTATION, WARRANTY OR GUARANTEE THAT THE CONTENT THAT MAY BE AVAILABLE THROUGH THE SERVICE IS FREE OF INFECTION FROM ANY VIRUSES OR OTHER CODE OR COMPUTER PROGRAMMING ROUTINES THAT CONTAIN CONTAMINATING OR DESTRUCTIVE PROPERTIES OR THAT ARE INTENDED TO DAMAGE, SURREPTITOUSLY INTERCEPT OR EXPROPRIATE ANY SYSTEM, DATA OR PERSONAL INFORMATION. TFG INC IS NOT A FINANCIAL PLANNER AND THE SERVICE IS NOT INTENDED TO PROVIDE LEGAL, TAX OR FINANCIAL ADVICE. The Service is intended only to assist you in your financial organization and decision-making and is broad in scope. Your personal financial situation is unique, and any information and advice obtained through the Service may not be appropriate for your situation. Accordingly, before making any final decisions or implementing any financial strategy, you should consider obtaining additional information and advice from your accountant or other financial advisers who are fully aware of your individual circumstances. connection or relationship with the owners of those products or services. services recommended on this website. You should perform your own research and exercise due diligence prior to purchasing products or services from any website. make a purchase of the recommended product or service, the website owner may receive compensation. This agreement is effective until terminated by either party. You may terminate this agreement at any time, by destroying all materials obtained from all TFG Inc site, along with all related documentation and all copies and installations. TFG Inc may terminate this agreement at any time and without notice to you, if, in its sole judgment, you breach any term or condition of this agreement. Upon termination, you must destroy all materials. In addition, by providing material on our websites, we do not in any way promise that the materials will remain available to you. And TFG Inc is entitled to terminate all or any part of any of its website without notice to you. To the extent you have in any manner violated or threatened to violate TFG Inc and/or its affiliates' intellectual property rights, TFG Inc and/or its affiliates may seek injunctive or other appropriate relief in any state or federal court in the State of Nevada, and you consent to exclusive jurisdiction and venue in such courts. If a dispute arises under this agreement, we agree to first try to resolve it with the help of a mutually agreed-upon mediator in the following location: Las Vegas, NV. Any costs and fees other than attorney fees associated with the mediation will be shared equally by each of us. If it proves impossible to arrive at a mutually satisfactory solution through mediation, we agree to submit the dispute to binding arbitration at the following location: Clark County, NV, under the rules of the American Arbitration Association. Judgment upon the award rendered by the arbitration may be entered in any court with jurisdiction to do so.